A big thanks to our attending dev community, presenters, internal team, sponsors, enthusiasts, volunteers, event team, students and other stakeholders for coming together for another phenomenal Devcon3! First of all, yes, video of all sessions, both from the Main Hall and Breakout Hall will be posted on the Ethereum Foundation YouTube channel as soon as our post production team can finish them. This year I contracted and brought a post production team to the venue with us so they could start work onsite as soon as the raw footage could be handed over. Since we had two halls instead of one, the number of presentations to process was close to double, so the guys are working hard to cut, edit, render and upload four days (versus three days from last year) of devcon presentations to the web. There will be a tweet (@ethereumproject) in the next 7-10 days! Secondly, as promised, we spent the requisite time and resources to engage vendors who could deliver free live streaming of the main stage presentations so that people who couldn’t be at the venue could see the Main Hall presentations in real time. By all accounts, live streaming went well for those who had a conducive internet connection. Thirdly, the photos taken by the official Devcon3 photographers are ready! They are now being prepared in albums to be shared online early next week. As Executive Director of the Ethereum Foundation, one of my responsibilities is running Devcon, and it is with pleasure that I am able to plan and execute our annual developers conference, including enjoying being an emcee for the event, which allows me to engage more with our development community than any other time during the year. It was a tall order to meet the high expectations our attending community had for Devcon3, which is why planning began 10-11 months ago. When we finally opened the event, everyone felt the time, effort and work to plan such an event was worth it. I personally returned to Cancun a number of times to scale the event up four times in response to popular demand and to accommodate as much of the overflow as possible. Happily, we were able to safely and effectively increase capacity and Cancun ended up being the most popular location we’ve had to date. After the multiple capacity increases for Devcon, the number of people we were able to safely accommodate in the end was close to 2000. It was not without substantive effort from all our event teams to provide an event with 2.5 times the attendees as last year while increasing the physical space from one ballroom to making use of conference center in which we utilized three floors at any given time, and occupied over 78,000 square feet of rooms, open areas, auditoriums and halls. 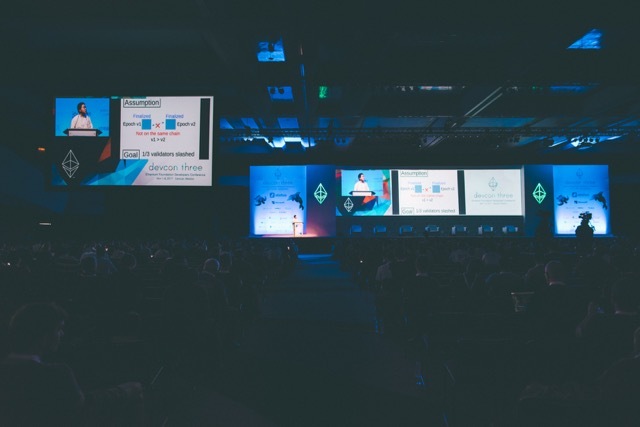 For the first time, Devcon provided: a second presentation hall, enabling 40% more sessions; a press room with a live feed of the main stage presentations; various meeting rooms and open spaces for networking; larger customized sponsor “booths”; presenter work areas; devcon and internal team work rooms; and two scheduled breakout sessions (one on the subject of zk-SNARKs research with Eli Ben Sassoon as special guest speaker, and a breakout session on P2P technologies organized by our Swarm team). Originally, locations in US cities were considered, but a substantive number of emails to the Foundation asked we do not hold Devcon in the US due to inability to acquire visas. The current less than welcoming immigration policies and long delays travelers have experienced just in transferring planes or laying over in the US was also not conducive. Hopefully the situation will improve in the future. Nevertheless, I’m pleased to say that not only was our Devcon3 venue devoid of security incidents, many attendees have shared photos and stories of their meetups, excursions and enjoyment of the world-class beaches, trips to Mayan ruins, and time in the sun and warm blue waters of Caribbean outside of the venue. The Cancun hotel zone was the best location to provide the needed services in the area, including lodging, capacity, internet access and amenities to hold a conference like Devcon. Since Devcon is expected to increase in size by some margin, venues will likely remain in developed and/or more urban areas. Though I’ve been in the crypto space since 2010, it wasn’t until I ran Devcon1 that I realized why the Ethereum community was so unique and valuable to the greater blockchain ecosystem. It became clear that the Foundation’s R&D focused program would best serve developers with a curated R&D-centric program to enable developers to come together in realtime, face-to-face at least once a year. The Devcon experience naturally embodies a kind of cohesiveness in spite of a realm that typically communicates virtually/remotely and asynchronously. In any case, the energy and excitement at Devcon is not quite tangible unless one is physically present. For those people who were unable to attend, this year we provided segregated bandwidth for live streaming. As an aside, we were informed by last year’s venue that reliable live streaming was not available in China for any amount of money, but that is part of cost of having an event in certain countries, which in our estimation was still well worth it, especially as last year was an important one to support the interest, growth and momentum coming from the growing Chinese community. There are now many events in the Ethereum, crypto and blockchain space and even more appearing to serve various sectors and special interest groups including events for enterprise, insurance, banking, fintech, financial services, investors/VCs, the energy sector, government, education and related hackathons, pitch-offs, etc. As Ethereum moves towards greater adoption, it becomes even more valuable for the Foundation’s developers conference (Devcon) to stay true to one that addresses platform, base layer development and research. The work our developers and others do at the platform development and research level is critical to informing the work done by applications developers, business people, executives supporting and innovating in emergent tech, as well as inventors, technology systems designers, and other progressive thinkers incorporating or using the Ethereum platform in their businesses and organizations. Our R&D projects have grown steadily from about six areas of development two years ago, to around twenty efforts and sub-projects today. See the periodic roundup summaries on the Ethereum blog for reference. It’s no secret the demand for Ethereum developers far exceeds the supply. For this reason, we deliberately set aside a percentage of passes this year to provide to students, professors, researchers and university people, who tend not to have the resources or time to easily attend events like Devcon, but are an important factor in supporting a healthy pipeline for developers while contributing to academic research, thought and investigation, all of which benefits the community and ecosystem at large. I’m pleased to say Devcon3 had the biggest and most international showing of students and university people to date. Of course there is always room for improvement and the best event can be even better. Next year we are looking into using RFID passes used by events like Comicon to improve registration, and we will likely increase the capacity of the second hall and possibly add additional “tracks”. The location is determined by a number of logistical factors, and while we welcome input like last year, since our community is an international one, no single location comes to the forefront. Devcon has come a long way in the last three years. Devcon0 was an internal developer gathering in Berlin with about fifty people. Devcon1 was held in a ballroom in London with a capacity of 300 people, though closer to 400 people attended. Devcon2 was in a grand ballroom at a hotel in Shanghai with a capacity of 700 people, topping out at closer to 800 participants. We were 2000 participants strong this year! To reduce the carbon footprint of such a large event, and to support the local economy, we sourced everything locally from printing, manufacturing, and production of items for the event, and gave preference to locals for volunteer opportunities. Most if not all of the Mexican residents and Spanish speaking volunteers from neighboring countries would not have been able to participate if their only option was to pay for a US or European-priced event. The average monthly income in the Yucatan Peninsula is about how much the cost of deeply discounted student pass would be. Devcon3 volunteers were students, community developers and organizers, researchers, or Ethereum enthusiasts who went through a review and approval and interview process to join the event team. It is with their help, the cooperation of our attending community and our internal teams that we were able to together bring about yet another great outcome. In spite of how difficult, uniquely expressive and dramatic the world of crypto can be, Devcon as a non-profit developers conference has been a special event that amplifies the best our community and organization has to offer. Many thanks goes out to all the teams and individuals involved in this year’s planning and execution in no particular order: PR and external relations, graphic design and art direction; webdev, A/V, photography and post production team members; Foundation directors, legal team, executive and administrative assistants; program and agenda team members; local Mexican and Spanish speaking volunteers who helped with translation, communications with Mexican vendors, and volunteers working with press, performing emcee duties, helping with internal security and handling tshirt and registration; and our Mexican venue and vendor team leads and main contacts. 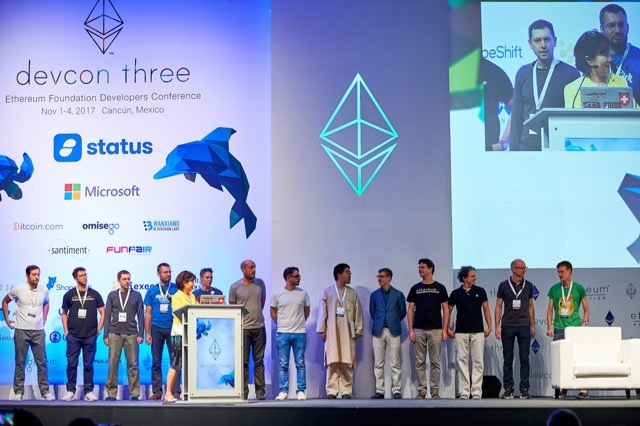 Of course thanks to all our team leads, researchers and developers for presenting on their projects and sharing their work, thoughts and time at Devcon3 and helping to coordinate their teams for panels and group presentations. Also, a big thanks goes to all the presenters in the agenda who provided information, insight, explanation and elucidation on their Ethereum research, development work, projects and efforts. Special thanks goes to Toya who spent by far the most amount of time assisting me with overall Devcon3 planning and execution. I’d also like thank all the Devcon3 top tier sponsors who went through a fairly involved process to participate in and support the event, as well as our community sponsors. For a second year, our program to involve small companies and startups was popular to the point of being oversubscribed months before the event. If we continue offering sponsorships next year, we will adjust the number of spots for community sponsors upwards to enable more startups and young companies with limited resources to participate. Finally and most importantly, it is the attending community interested in Ethereum development and research who not only represent the bulk of participants at Devcon, but are part and parcel of the positive, constructive and high energy that Devcon brings together. Our event greatly serves this community of people, which has been growing, evolving and gathering more momentum as the years go by (all three of them)!